Yes Recent RBI notification says that RBI will take back all currency notes issued prior to 2005. Although RBI has make it very clear that notes issued prior to 2005 will be valid and accepted in market. 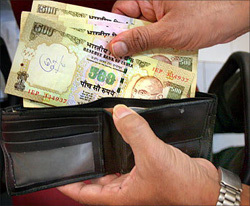 After 31st March, 2014 anyone can go in to bank to exchange old notes & coins. In order to return more than 10 notes of 100 Rs/- or 500 Rs/- at Bank after 1st July, 2014 one has to show ID proof and address proof. Why RBI is taking this step? You must be thinking why RBI is taking this step. We could find three different reason for this. (1) RBI wants to remove black money from market. Few years down the line RBI will remove these notes from circulation and usage. This will force everyone to deposit these currency notes to Bank. By this black money RBI can be controlled black money. (2) RBI wants to refresh currency so that old currency will be removed from market. (3) RBI wants to eliminate fake note circulation from market. As new notes are carrying more security it is difficult to copy. How to identify currency note printed before 2005? It is very easy to identify old currency like this. Currency Notes where you cannot find year of printing is note printed before 2005. This printing you can find at backside of note. Look at following image to get more idea. Do these notes will work after March? Yes RBI has made it clear that note will surely work as legal tender is mention on note. We have chance to submit this note till 30th June, 2014 after that RBI may stiff the rule. Do Share this Post with your friends on Facebook & Twitter!